The story of the 2015 Japanese race is that of a comprehensive Mercedes victory, rebounding strongly after their relatively poor performance in Singapore. In qualifying Hamilton and Rosberg traded places through Q1 and Q2, before Rosberg took pole (by 0.076 of a second), with the drivers in Q3 forced to abandon their final runs after Kvyat smashed up his Red Bull. It was Rosberg’s first pole since Spain and only his second of the season, and Hamilton praised the German for his stonking lap. With the title race entering its final and decisive phase, if ever Rosberg was going to display the fight and hunger that he needed to win the championship, now was the time. On pole, he held the advantage, and he needed to make the most of it. Hamilton though, had other ideas. Both Mercedes had reasonably good getaways, but it was Hamilton who started better, getting virtually alongside Rosberg into turn 1 and squeezing his teammate as they entered turn 2, forcing Rosberg to lift slightly to avoid contact (and in the process, Rosberg slipped down to fourth). Hamilton, for his part, was unrepentant, stating that he had held the inside line, and therefore it was his corner. It was certainly gutsy, and typical of Hamilton at his most ruthless and aggressive, leaving Rosberg to decide whether to chance having an accident or not. The win was routine for Hamilton at that point, pulling away from the Ferrari of Vettel at a steady rate whilst Rosberg was unable to quite mount an attack on the Williams of Bottas ahead of him. Behind the leaders, contact between Massa and Ricciardo saw both of them collect a puncture at the very start of the race, ruining any prospect of points for either, whilst Perez ran very wide at the very first corner, albeit not as a result of the other incident. Whilst Hamilton was pulling away, his team used strategy to try and get Rosberg ahead of Bottas. After the first set of stops Rosberg was still behind the Williams, but a bold move into the final chicane saw him move up to third, with the sort of forceful overtake that we haven’t really seen Rosberg do very often. He would get by Vettel when the pair pitted, but could do nothing to prevent Hamilton cruising to victory. 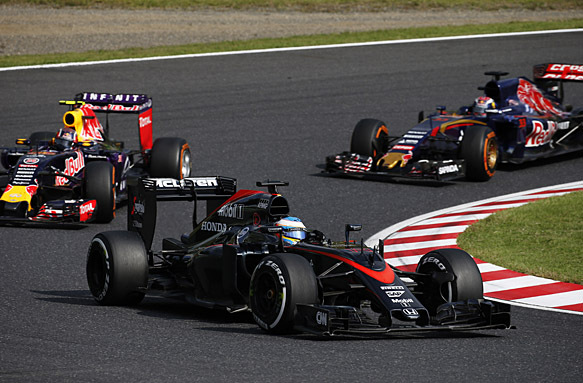 The ongoing struggles for McLaren-Honda seem to grow. On a weekend where it was rumoured Button might announce his retirement (he didn’t), Alonso blew a fuse as he was passed left right and centre by cars that normally would be close on pace. At one point, he was loudly complaining on the radio that his engine was like a GP2 engine, and after the race he initially refused to say that he was committed to the team. He has since clarified his remarks, insisting he will stay, but such a public rebuke of Honda (especially on their home soil) is a sign of a driver who is clearly very frustrated. Ron Dennis has said he wants both Alonso and Button to stay, but in F1, nothing is certain. Once again Max Verstappen showed good racing instinct to climb from near the back of the field (he took a three-place grid penalty for an unsafe track stop) to finish ninth, beating his teammate Sainz in the process. He has shown he is not afraid of established and more experienced names, and as he gets experience of his own, it seems the only way is up for Verstappen. 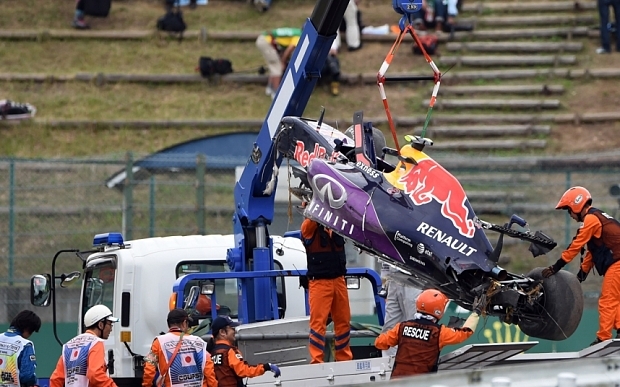 In particular, he hounded the usually quicker Red Bull of Kvyat, and showed good composure. Force India’s Hulkenberg also showed good form, following a couple of less successful races. He too started further down the field (having taken a three-place penalty for causing a collision with Massa in Singapore), and he too worked his way back up the field, finishing a highly credible sixth. Lotus, the subject of financial woes and a possible takeover by Renault, had a quiet race, not getting into trouble, with Grosjean finishing seventh and Maldonaldo taking eighth – important for the cash-strapped team. 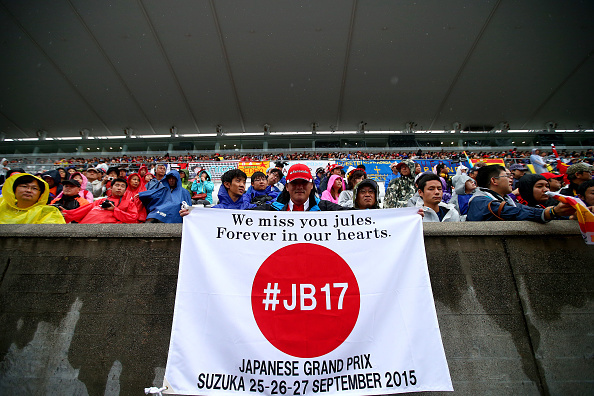 Finally, the Manor team had faced a challenging weekend, on their first visit to Suzuka since Jules Bianchi sustained his ultimately fatal injuries here. As ever racing at the back, both their drivers showed great reactions to avoid a huge accident with each other – Will Steven’s span as they approach the final chicane, but managed to keep the car on the track and out of the barriers, whilst Rossi managed to avoid t-boning his teammate moments later. The end result of Japan is that Hamilton is now on 277 points, 48 points clear of Rosberg, with 125 points max remaining from the final five races. Such is Hamilton’s advantage that he could afford to finish second to Rosberg in all the remaining races and still win the title – you can bet that he won’t settle for second though.